In Thursday’s seminar, we discussed the growing skepticism regarding metanarratives which defines postmodernism. Postmodernism challenges a single metanarrative by encouraging localized and diverse narratives; postmodern thinkers claim that existence is too complex to simply be told in a single narrative. The Law of Attraction is an increasingly popular paradigm in the western world. Historians claim it has roots in the American New Thought movement and German Idealism; however, it appears to also have emerged in the East in Vedanta, ancient Chinese philosophy and many other schools of thought. The Law of Attraction (by my understanding) is a belief that the universe is more complex than can be understood by human perception. As a result, our perceptions of reality are based on our own thought projections and beliefs — whatever it is that we focus on and wish to see, will be able to manifest itself (like attracts like). For example, if a person tells themselves “I always seem to be sick,” then their body would subconsciously manifest illness. This may not occur instantly, but the Law of Attraction states that it opens the possibility for sickness to occur. This manifestation may also be subtle — perhaps the individual in question begins to forget washing their hands, or begin to eat questionable food — regardless, the mental thought (sickness in this case) would be rendered more likely to materialize than if their belief was “I rarely get sick”. This is one simplistic example in what is a complex philosophy — nevertheless, the basic premise of the Law of Attraction is able to simultaneously support and challenge postmodernism as a whole. The Law would allow each person in the world to experience a different reality — this fits with the postmodernist idea of “petits réchits”. However, the idea that each person’s interpretation of the world is different stems from a single basic metanarrative: whatever one experiences is manifested by themselves. In this case, the Law of Attraction simultaneously supports and contradicts the anti-metanarrative ideas of postmodernism. One criticism of the Law of Attraction has been its lack of falsifiability (the ability to prove a hypothesis as false). Scientists claim that the Law is not scientifically testable. If the experiment results in the claim that the Law of Attraction does not work, believers would merely say that the researcher simply manifested the result which they wished to see, and that in itself is able to prove the Law. As a result of this lack of falsifiability, the Law of Attraction has subsequently been given little thought under scientific study — but this may just be further proof of the issues with using science as a metanarrative. It seems odd that in our many discussions regarding John Berger’s art criticisms in Ways of Seeing, we never discussed the most immediate visual in the book: the cover. It is a painting by the Belgian artist René Magritte, and the fact that Berger chooses a work by Magritte is rather unexpected — given the philosophical beliefs of the artist. The oil painting The Treachery of Images is arguably Magritte’s most well known painting. The visual depicts a realistic pipe accompanied by the words “Ceci n’est pas une pipe” (This is not a pipe). 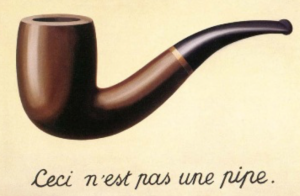 While the painting and the subtitle initially seem to be contradictory, it slowly becomes apparent that it is not: Magritte has created an image of a pipe, and not a physical pipe itself. The relation between visual and text of The Treachery of Images expresses Magritte’s belief that even the most realistic of images would never be able to accurately capture an object. Berger claims in Ways of Seeing that “what distinguishes oil painting from any other form of painting is its special ability to render tangibility …[and] although its painted images are two-dimensional … [its realism can fill] a space and, by implication, fill the entire world” (89). This claim that oil painting is a medium that allows for close representation of reality is one Magritte would agree with. However, the claim that it can “fill the entire world” with suggestions of physical objects would not be taken well by the Belgian painter (89). In this specific instance, Berger argues that oil painting is a depiction of objects which is realistic to a point of great symbolic value, while the man who created the image on the cover believes that there will always be a significant gap between an image and the object it depicts. René Magritte’s painting The Treachery of Images. The seminar discussion regarding hypertext poetry and McLuhan’s famous quote “The Medium is the Message” links back to Dabydeen’s Slave Song: although the medium of poetry and printed text is a familiar one, his criticisms of colonialism lead one to question his choice of medium. The form of Slave Song can be seen to be just as thematically significant as that of Strickland’s “The Ballad of Sand and Harry Soot”. The combination of Creole poetry and critical apparatus create a hypertext of sorts — Dabydeen provides the option to work through his text in any way the reader desires. By allowing readers the freedom to consume the text in any desired manner, each reader of Slave Song unknowingly becomes complicit in the discussed issue of colonialism. Based on the order one chooses to read the various components of Slave Song — the Creole poems, the notes, the translations — the reader’s image of Guyanese culture will vary. With the agency to decide how to consume such a work, the reader is complicit in manufacturing that which they wish to see. The criticism of an overly simplistic search for an cultural authenticity is thus exemplified by the very form through which Dabydeen delivers Slave Song. The style of architecture featured in the sets of The Cabinet of Dr. Caligari is emblematic of German expressionism. As a movement aimed at externalizing internal thoughts and emotions, it is not surprising that the mise-en-scène — and sets by extension — would serve as a reflection of the events in the plot. The sets used in the film not only consistently externalize the emotions felt in the scene, but the events in the plot as a whole. With most of the film’s events occurring within the mind of a deranged patient, the lack of right angles and rectangular, symmetrical architecture shows the state of madness. The only time in Caligari when straight lines in doorways and buildings are visible is towards the end of the film, inside the asylum. While an ironic place to find symmetry and order, this contrast from the style in which the rest of the town is depicted shows the difference between the hallucinations of the protagonist and the reality of the world. As an expressionist film, The Cabinet of Dr. Caligari has indeed expressed the inner thoughts and emotions of Francis in every way possible — especially in the world around him. Early on in The Idiot, Prince Myshkin tells the story of a man about to be executed who has an epiphany. When faced with the imminence of death, the convicted man felt time slow down to a point where “five minutes seemed … an infinite term” (64). The man became frustrated at this thought, thinking that if “life were returned to [him, he] would turn every minute into an entire age” and never waste a moment of his life (64). Despite this epiphanic moment, he still found that he “wasted many, many moments” after his life was spared. While this is an extreme example of an epiphanic moment before an absolute sentence, I find that a similar realization often occurs in our everyday lives. Albeit on a much smaller scale and a more trivial matter, often I find myself feeling the same sense of mystical clarity the night before an assignment is due. With an imminent deadline and an incomplete essay just hours before it is due, “the whole awful torture lies in the fact that there is certainly no escape” from it; there is no chance for an extension or aid of any sort (24). In such scenarios, I also find myself similarly dividing the remaining time: two more hours for writing, then thirty more minutes to review, a quick break for perhaps a cup of tea — then the final read before submitting. These minutes seem “a vast wealth” of time, and I promise that with the next assignment “I would count every minute, and wouldn’t waste a thing for nothing” (65). However, much like the convict described in Dostoevsky’s The Idiot, I find with each passing week that I have not learned at all, and with many other assignments, “wasted many, many moments” (65). 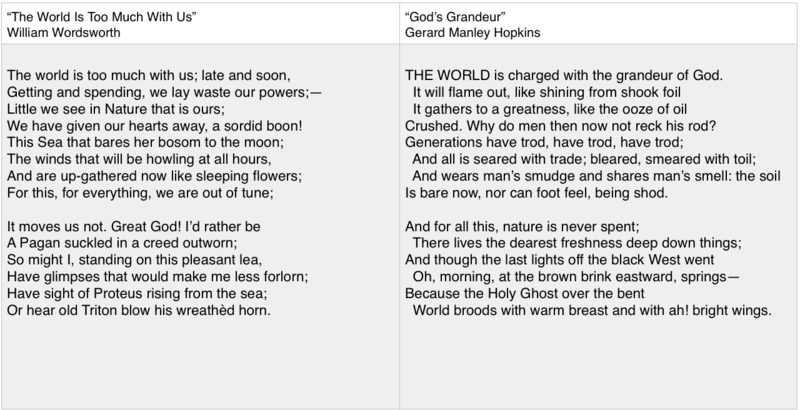 When we were analyzing Hopkins’ “Gods Grandeur,” I couldn’t stop thinking about the similarities between it and the Wordsworth poem “The World Is Too Much With Us” (which also happens to be the only Wordsworth poem I’ve read). Both poems deliver a similar message; they describe the worsening disconnect between man and nature and refer back to a time when the beauty and power of the natural world was appreciated. In both poems, a Petrarchan sonnet is the form used to deliver such a message. Petrarchan sonnets are unique in the way which their form is utilized: the octave generally presents an issue or problem, and a response or solution is proposed in the following sestet. Both Hopkins and Wordsworth present the issue of a growing disconnect from nature, which they then later claim needs to be appreciated as the divine form that it is. It can be seen that both poets have chosen to begin the poem with “The World” (1). Once again, their similar thoughts are evident in that the environmental issues associated with industrialization are described as something global, a problem which encompasses each person who lives in the world. 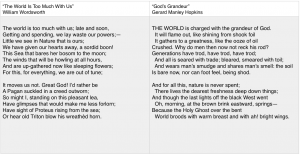 Hopkins and Wordsworth then both claim mankind is responsible for such a disaster: Wordsworth describes mankind as being “out of tune” with nature, and Hopkins similarly says that men have lost all connection with nature. In the sestet, differences between Wordsworth and Hopkins begin to emerge. Wordsworth blatantly claims that he would rather “be/ A Pagan” than suffer through an increasingly unnatural world. He then goes on to refer to divinity in nature with ancient Greek figures, specifically naming Proteus and Triton. This clear rejection of established, industrial England is very different from Hopkins’ sestet, which proves to be much more optimistic. He claims that “nature is never spent” despite all it has gone through, and proceeds to describe a beautiful image of “the Holy Ghost” which can be seen as the world recovers. Hopkins’ optimistic, religious conclusion can be contrasted with Wordsworth’s much more pessimistic and cynical conclusion. Despite these overall differences, the two poets show great similarities in the way which they perceive and communicate ideas; it is no wonder that they are now both recognized as great figures in English poetry. I’ll be honest — I don’t really know what to write about Rousseau. After hours of staring at a blank computer screen and flipping through A Discourse on Inequality, I still find myself banging my head against the wall. What is it about Jean-Jacques Rousseau that makes writing a simple response about him so difficult? I feel that my lack of response to A Discourse on Inequality may partly be due to the style in which it is written. While it is a translated text, the writing style presented certainly makes the ideas presented in the work very easy for the reader to consume. Thus, it seems that the reader can easily fall into a state of passivity while reading. In Plato’s Republic, the dialogue form utilized forces the reader to remain active in the relentless exchange between Socrates and his interlocutors. Hobbes’ Leviathan is constructed with such mathematical precision that a reader must remain thoroughly engaged and critical in order to follow his argument. Because Rousseau’s writing is much less intimidating, it is absorbed almost instantaneously and an understanding of his philosophy forms much faster (and with less resistance). That being said, the catchy, story-like fluidity of A Discourse on Inequality does not mean that words are wasted — Rousseau manages to saturate his words with many ideas. Rousseau works through many ideas regarding the development of man as he nostalgically describes a glorified, nascent state — these arguments are of great complexity and he finds a successful way to deliver them in a simple and understandable manner. A Discourse on Inequality was definitely much easier to digest than other philosophical texts, and maybe that is why it doesn’t seem to leave a strong aftertaste. The thing with working an entry level job is that sometimes business gets really, really slow. When that happens (which it does pretty much every night around 1 am) you find your mind exploring some rather strange ideas. For some bizarre reason, tonight I found myself visualizing a dinner party — with all the dining guests as famous philosophers. This led me to wonder: if Plato and Thomas Hobbes were to meet, would the two of them get along? The image of Plato and Hobbes breaking bread together seems quite intriguing, albeit rather peculiar. In both seminar and lecture, many points have been raised discussing the various similarities and differences between the two philosophers. Plato’s dialogue and usage of the Socratic method has been juxtaposed with Hobbes’ mathematical treatise, and similarly with their views on truth and the existence of metaphysical Forms. On the other hand, many have pointed out the strong similarities between the ideas of the two government; both philosophers seem to agree that the ideal society functions under a monarchy and is a macrocosm of a healthy human being. At this imaginary dinner party, it appears that the greatest difference between the two philosophers would be the one pointed out by William of Occam. The two philosophers clearly hold very different stances regarding human nature and action: I find it difficult to believe that Plato and Hobbes would not be in fierce debate regarding the ideas of justice containing intrinsic value as well as the natural state of man. Having said that, I feel that the two men would get along and enjoy the company of each other. Plato’s love of the elenchus would surface as he would attempt to probe Thomas Hobbes in search of faults in his argument, and Hobbes would gladly respond with structured, mathematical eloquence. Although the two philosophers may hold several strong beliefs on contrasting sides, they would both be happy to engage in discussion: their mutual love for logic and philosophy may just be enough to crack a smile on what appears to be two permanently frowning faces.